Every year I say that I am not decorating as much as I did the year before. Before I finish the dissertation on how I am taking it easy, and enjoying the ride, I find myself already covered in glitter and looking through Pinterest. This year was no different. I didn’t go crazy with Pinterest ideas but I did use glitter and bits of it will be in my hair until next Labor Day, at least. 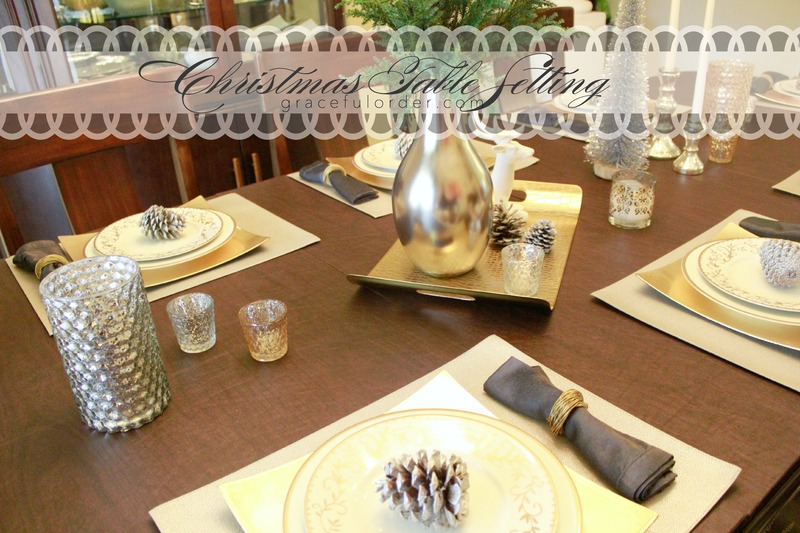 I decided to do a “simple” (I always feel I have to put that in quotations) silver and gold Christmas tablescape. 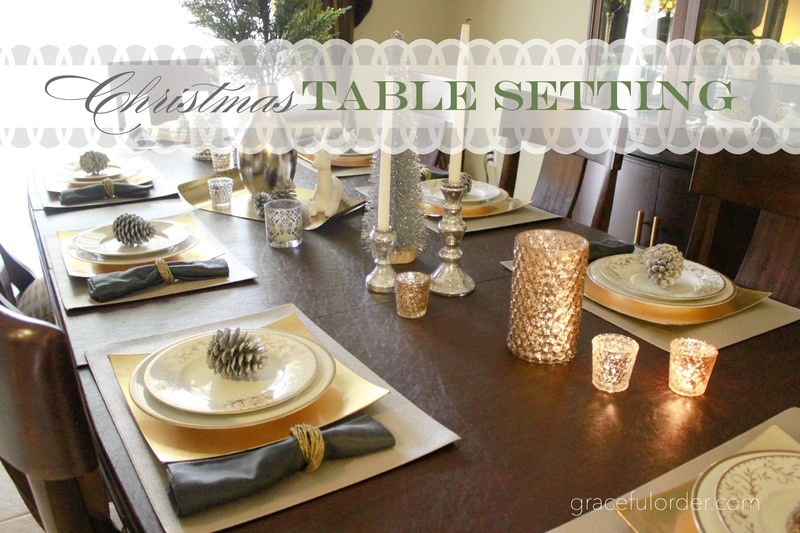 Most of the items I used were not Christmas items but when united with certain touches, the overall look was definitely a winter inspired table. I bought these silver embossed placemats from Target and I know that I can re-use them throughout the year. 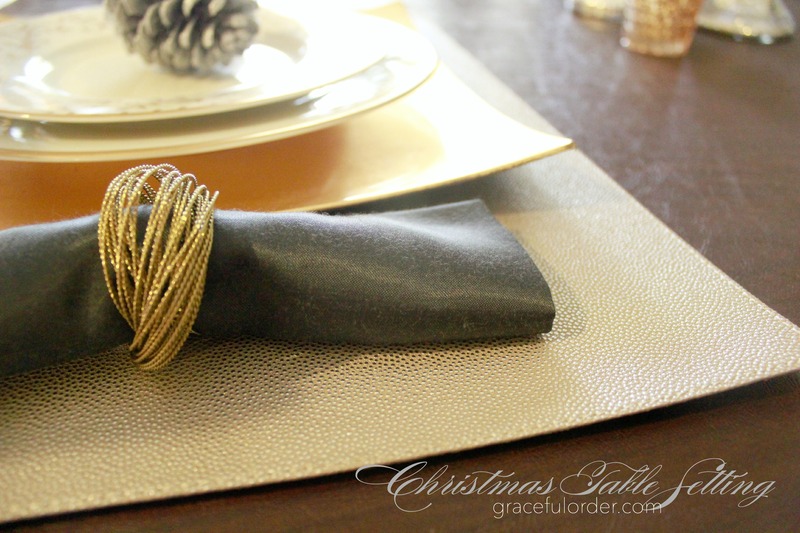 I also like the contrast of the silver and gold so I added gold napkin rings to the dark gray napkins. 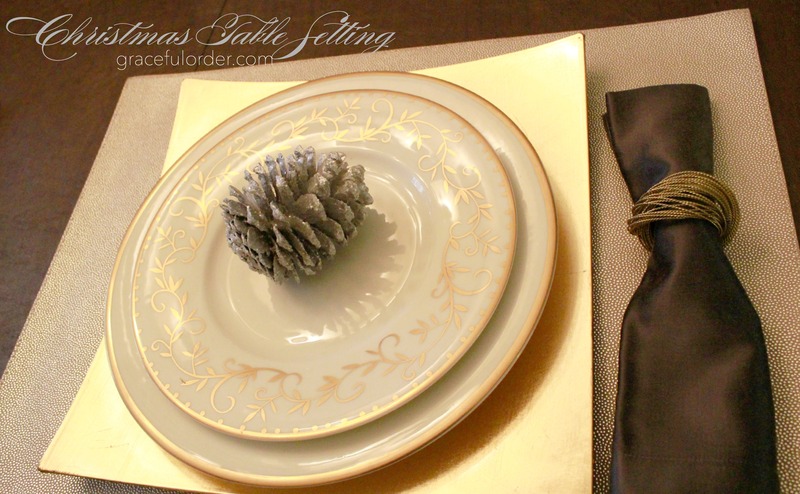 I spray painted these pine cones silver and added clear glitter while the paint was still wet. Glitter is something you always regret after-the-fact but in the meantime it looks great! I purchased the plates at Crate & Barrel in a Christmas clearance sale. I love the fact that they are “holiday” but can also work year-round. 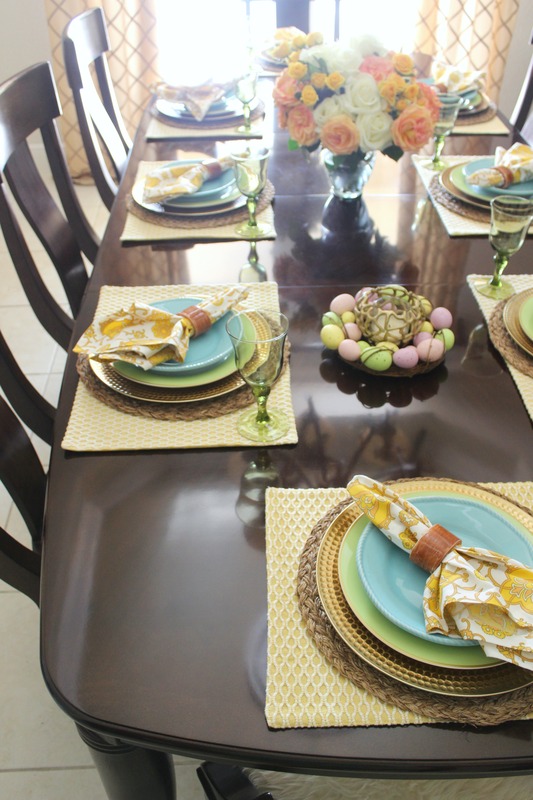 Especially the dinner plate which only has a gold rim and no other design. After Christmas sales are the best for stocking up on items that you can use the following holiday season. 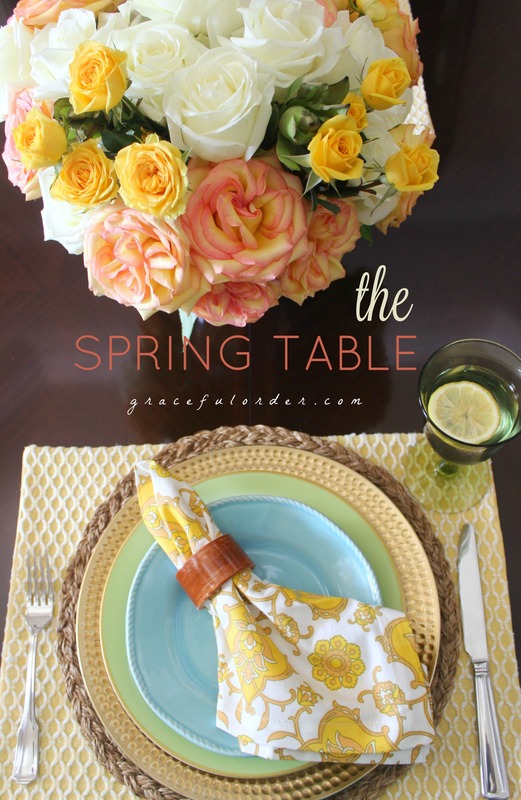 The centerpiece is a conglomerate of items, mostly items that I display year-round in our home. A deer that I found at Target, a gold-croco tray, a silver vase with 2 stems of evergreen and candles. The votives are also from Target and the large candle is from Erin Condren. The rest of the table has glittered trees and candelabra. Our dinner table seats eight, and I was able to fit quite a bit on the table without it looking overly-crowded. 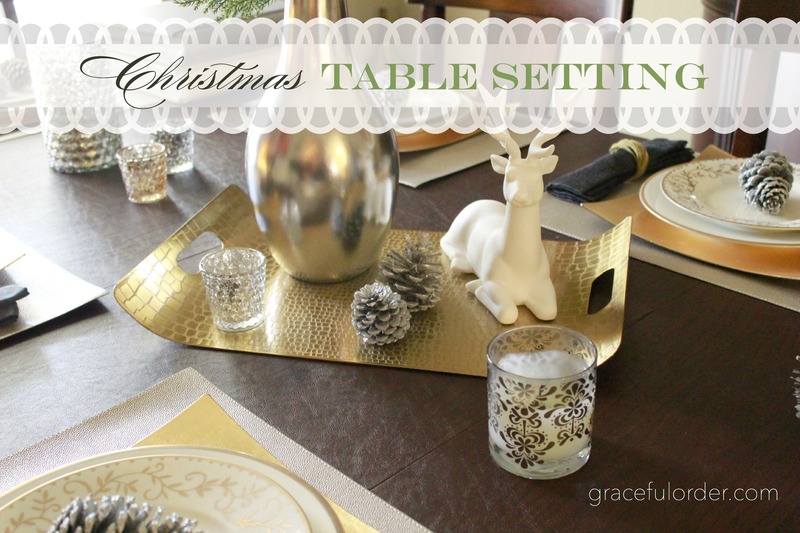 So that’s one Christmas Tablescape, I will share another look soon. If you follow me on Pinterest, you may notice me pinning tutorials on “how to get glitter out of your hair” but don’t fret, tomorrow I am back to researching new years party ideas. Hang tight. Seriously, it took me five minutes. 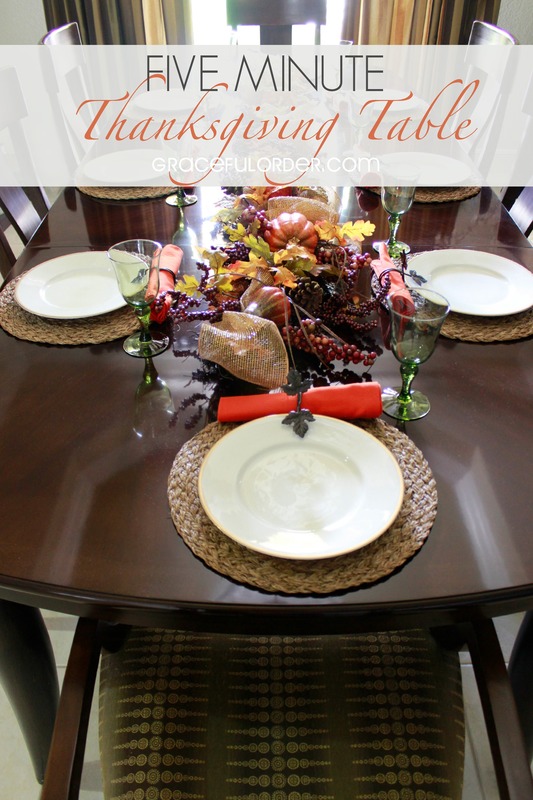 Granted, I used the same plates and placemats that were already displayed in our dining room but even if I had to add these, it would be close to a “Five Minute Thanksgiving Table”. 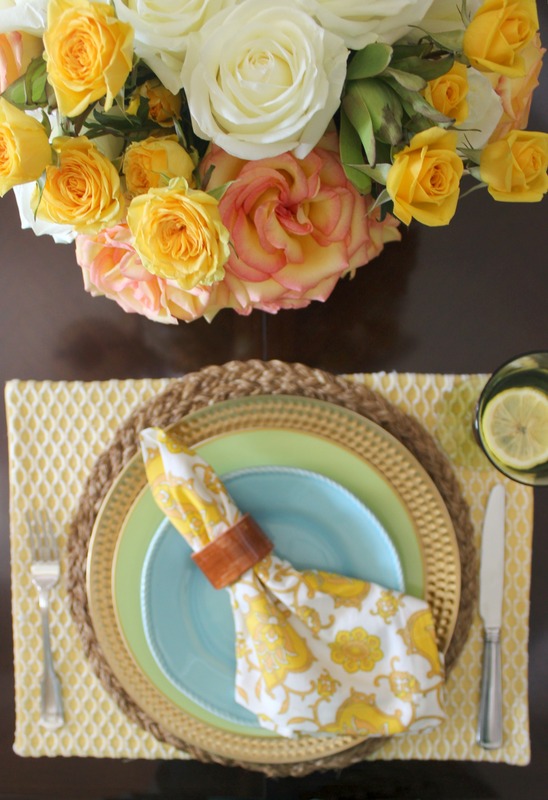 What is the trick to this fast table setting? 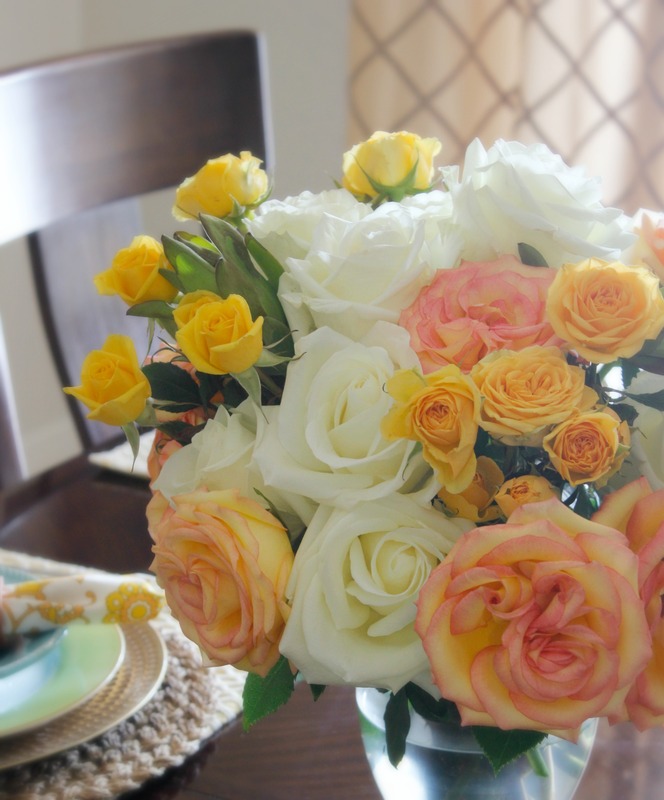 Using swags as a centerpieces. 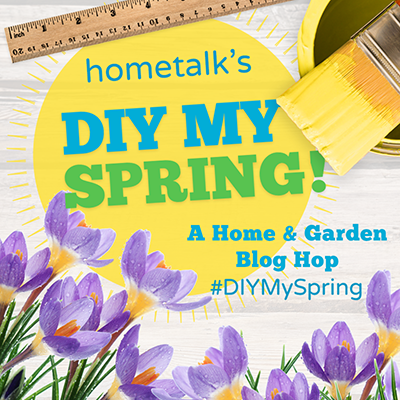 Swags are meant to hang above doors or hallways, and they usually have a bendable metal frame. All I did was straighten out the swag to eliminate the curve and add it to the center of the table. In this case I used two since my table is so long. 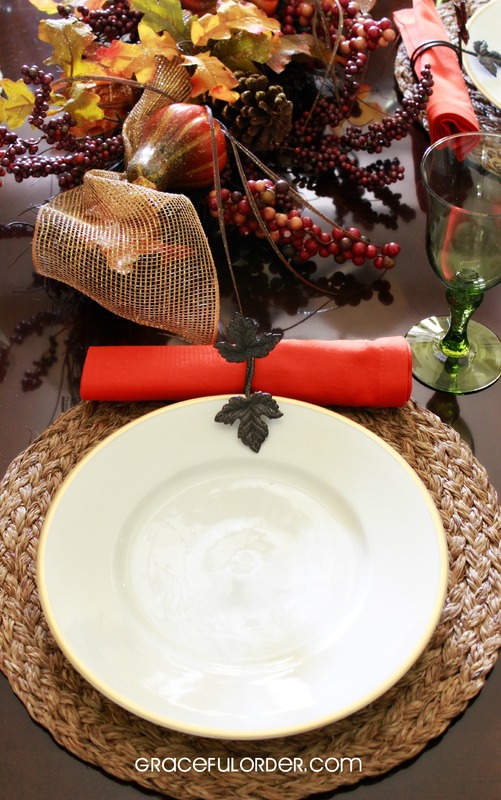 Then I added these leaf napkin rings to some bright orange cotton napkins. 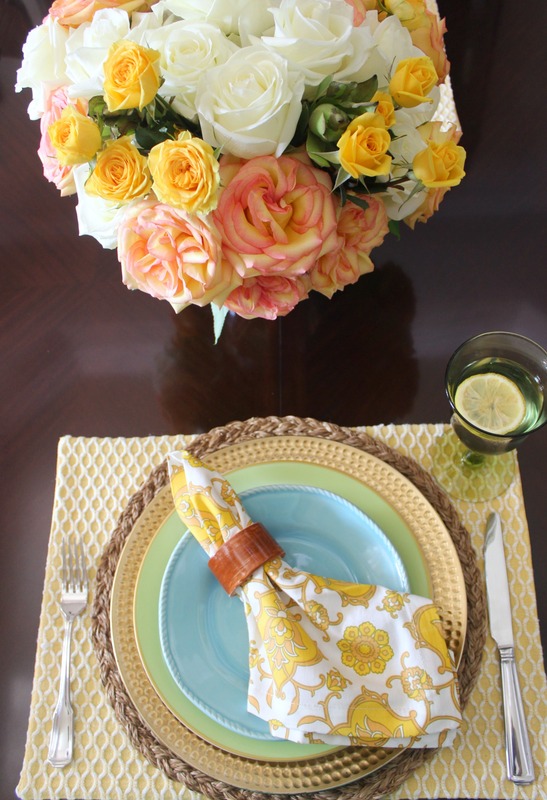 I placed the napkin above the plate so the napkin ring would stand out a bit more. The finishing touch was the green goblets. Well, the real finishing touch will be the turkey but that will take a bit more than five minutes to finish up! 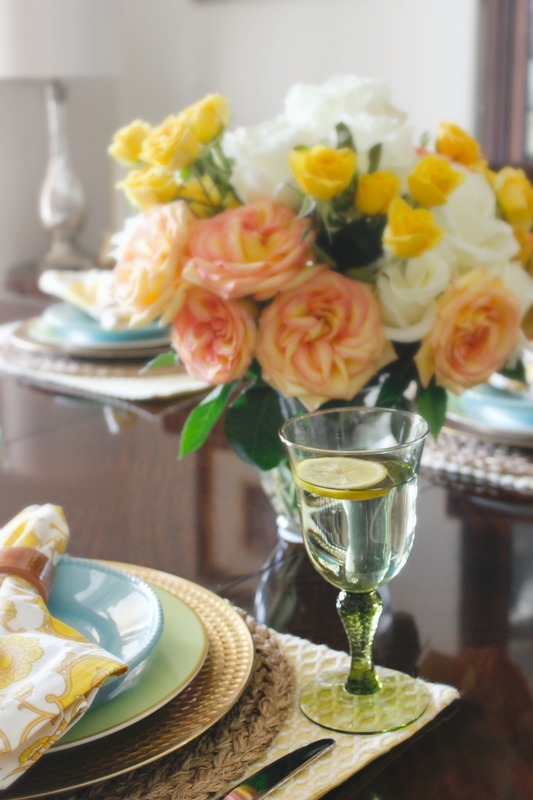 This is a very quick and easy tablesetting even if it takes you longer than five minutes. 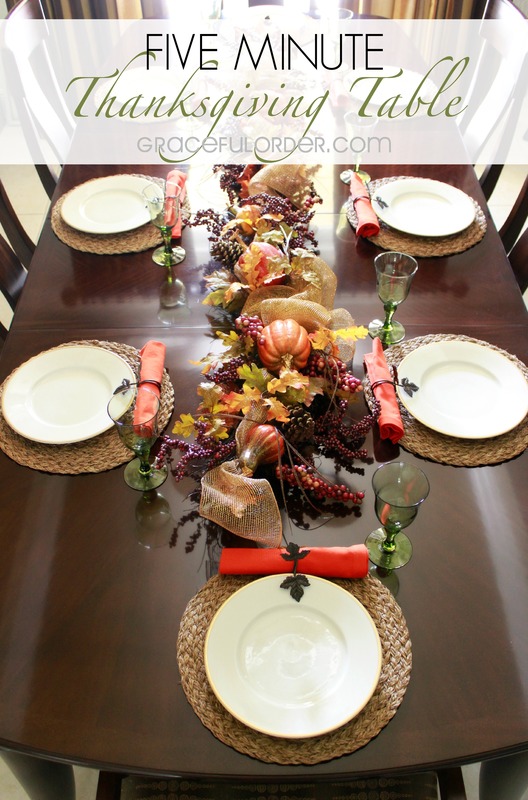 I will share another thanksgiving table setting later this week so stay tuned. 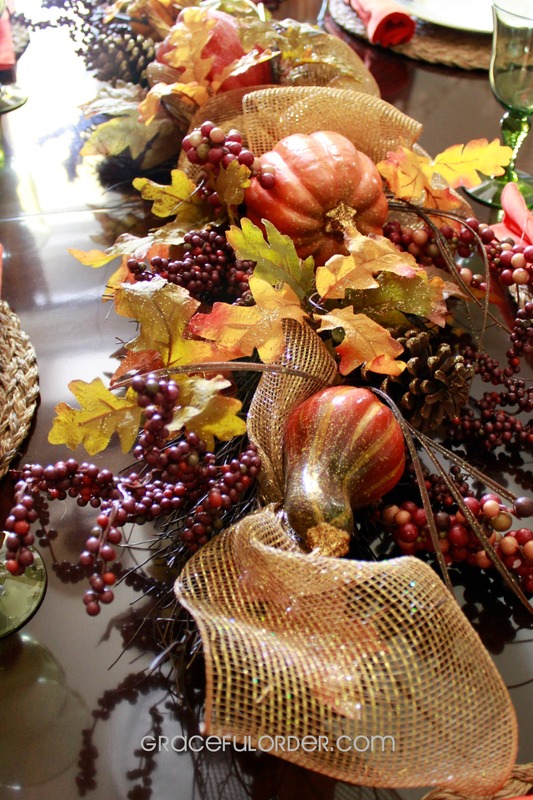 In the meantime, share with me your favorite ways to set a thanksgiving table. For more fall tips, check out my perfect thanksgiving gifts, fall porch and fall mantel posts from earlier in the month!